Seeds of Love by Maria Dunn. Essay. The Write Launch. I place my hand on his stomach where I can feel his heart beating strong and steady. Thump‐thump, thump‐thump, thump‐thump ‐ a strong heartbeat, a healthy heartbeat. Suddenly aware of my own, I notice our hearts beating in unison as though they are somehow connected or one and the same. I reflect on his fight, his magical powers, his ability to come back and defy all odds. The sickness, the surgery, the car crash, the transplant. Once dubbed “The Man with 9 Lives,” he always possessed superhero powers that never failed to bring him back. Now the doctors say his cape is tattered and torn and will no longer be able to protect him. I know him better than anyone and he will prove them wrong. It’s only minutes before he opens his eyes. I run my fingers along his hands, now swollen and barely recognizable. I yearn to see his long, lean hands that held me as a child and the way they gripped the wheel of his blue Crown Victoria, Hank Williams, Jr. blaring on the radio as he drove me to places I had never been. Those hands, the ones that reached into his pocket for peanut M&Ms each time he returned home from a week on the road, now belong to someone else – to someone who is a memory. Replaced with hands too swollen to move, I caress them in hopes that he feels my presence, in hopes it will be enough to bring him back to me. Without our memories, we are nothing but a blank slate and have nothing except the ability to live in the moment. As this cruel reality hits me for the first time, I realize remembering is too painful. Not remembering is too painful. Caught somewhere between the past, the awful present, and a grim future, I only survive. Until a force far stronger than myself propels me into a world I cannot yet grasp, I exist. Escaping for a moment to a happier time as a girl, I remember the bright blue skies of a spring day contrasting deeply with the rolling hills of green grass and bright yellow dandelions. I take one and hold it between my fingers, breathe in its fresh smell, and strategically begin picking its petals. I become particularly excited at the sight of a white puffy dandelion. A sign that it has lived out its days and is destined for a trip to another place, it waits patiently for a ride on the perfect breeze. I’m happy to oblige as I pinch one between my fingers, purse my lips together and slowly exhale. The soft white seeds hitch a ride on my breath and glide gently on to their next home, a place where they will once again grow. I run barefoot through the cool green grass stopping at each patch, picking and breathing until my tiny fingers are stained a greenish yellow and the smell has trapped itself in my skin. My escape is interrupted by a nurse who asks me to step out for a bit. As I leave my dad’s room, I feel like my body is a robot but my senses are hyperactive. My arms and legs work to propel my body forward while I slowly make my way down the hall, passing several critical patient rooms along the way. One man is breathing with the help of a ventilator, another appears to be unconscious, yet another is screaming in pain. At least my dad isn’t that bad, I think to myself. My father does not belong with these people. He’s not as critical. He can breathe. He can eat. He’s not in pain. I’m sure the doctors will say he can go home soon. I make my way down the corridor and path to the cafeteria, stopping in the chapel along the way. I sit in silence, breathe slowly, ask God to help us handle what comes our way and to not allow my dad to suffer, and then continue on my way. I have been to this cafeteria many times throughout my father’s many hospital stays, yet as I enter it no longer seems familiar. The bustling of workers and patrons is gone and many of the food stations are closed. It feels dead. I wander around looking for a morsel of food that seems appealing and find nothing, so I settle on a slice of cheesecake and a cup of coffee, hoping that the sugar and caffeine will power me through the night. I sit down half‐heartedly eating my cheesecake, as I watch the people around me. I watch and wonder about their stories, about their reason for being here, about their pain. I wonder if they are robots too and if their loved one is as close to discharge as my father. I wonder if they feel as alone as I do in this moment and if not, whether they have a hug to spare. I watch carefully, noticing emotions on some faces, but most are stoic, not revealing much about their story. I assume that none of them are like mine. I watch the healthcare workers with a different kind of curiosity. I wonder if they watch and wonder about our stories or if they search the faces of families for clues. I wonder if they can even see us or if we are just another landmark on their journey back to work. I envision the details they might tell someone who stopped them for directions: Turn left at the salad bar and then right by the flesh‐colored statues with four branches and faces that look like they once were human. From my father’s many hospital stays, I had noticed the different colored pants of the hospital staff. At first, I used to wish I could wear such comfortable clothes to work, to only have a choice of whether I wanted green or blue each day. I imagined that I would alternate, giving favor to the green as they would bring out the green eyes I inherited from my father. I watch closely as an older man with emerald green pants empties the trash and moves his can on to the next receptacle. One‐by‐one, he empties the trash of doctors and robots, of families and friends. I watch him for clues about his life and the only one he gives is a smile to those around him. I wonder if he is ashamed of his emerald green pants or if he is simply happy to put them on each morning. He seems friendly, quiet, and diligent. She notices the man with green pants in her path but when he doesn’t heed her warning, she nearly runs him over and without a thought, continues on her way. Perhaps like us robots, people with emerald green pants are another landmark along her way to somewhere far more important than any of us can imagine. I sit wondering what she would look like if her loved one were near death, if she had roamed the halls like a robot instead of a doctor, if she had one ounce of human compassion or related to anyone of a different color. I envision what she would look like wearing emerald green pants and a smile. Bringing myself back to reality, I make my way down the corridor and hallway back to my dad’s room in the ICU. Once again, I pass the critical patients and as I do, a part of me wants to look their way with a warm smile, while the other half looks away in shame. I feel their eyes watching me as the daughter of a man who doesn’t belong, of the one who is going home. I wonder if their families are having cheesecake and coffee. I come to his room where I prepare to suit up with the required cheerful yellow isolation gown and bright blue gloves before I enter. Ironically, just a few days before, doing this gave a sense of relief, a sense that I was protecting him from anything that would penetrate his torn cape. But now, each time, the ridiculousness of following the rules is highlighted as brightly as the yellow gown itself with words that say THERE’S NOTHING THEY CAN DO. Entering my dad’s room where he is sleeping in the same way I left him, I am greeted by a woman with light blue pants. Her warm smile and caring voice confuse me for a moment as I try to make sense of her role. She introduces herself as a doctor and asks for a moment of my time. “Has he seemed extra sleepy to you today?” she asks. “Yes. He hasn’t been very alert at all today and barely knows I’m here,” I report. I mentally recall my efforts to wake him, caressing his hand, watching his eyes occasionally open as they appear weighed down by life. My emotions begin to surface. She kneels down next to my chair and gently places her hand on my knee as she continues. Earlier in the week, my dad was alert and talking. Earlier in the week, he made the decision to not choose life support. Earlier in the week, we had more time! Pausing for a moment as she glances back and forth between my father and me, I notice her dancing warm brown eyes that complement her youthful face with unblemished skin, the kind of skin that has been spared the wounds of teenage years. Her youthfulness is hopeful, even in the midst of despairing news. I am not quite able to make sense of the hope she brings. Is it hope that she’s wrong? She’s a young doctor, a new doctor; she’s probably wrong. Is it hope that there’s a better life out there, a life unblemished by death, despair, or pain? Or is it hope, perhaps, that despite death, despair, and pain, there is still hope? She pauses again as if to wait for my response. My mind is racing. Are you expecting me to make a decision? Why are you even talking to me about this? I’m just his daughter, I’m a little girl! I’m not the one who can make this decision! “Can I have some time to think about it and discuss it with his wife?” I ask as my adult self. As his moment of discharge approaches, he is surrounded by those of us who mean the most to him. The room is so overcome with love that it feels as though time has stopped. Standing in his room watching him decline are three women, all of whom love him differently. The love of a wife and woman grieving the loss of her soul mate, the love of a mother grieving the loss of a child she delivered, and the love of a daughter who has never known life without her daddy. The idea enters my mind that perhaps our love, all joined together, is powerful enough to overcome this situation and I close my eyes to will him back to health. But instead, he simply sleeps as we weep. Slowly, his heartbeat becomes more faint and his breathing more shallow. 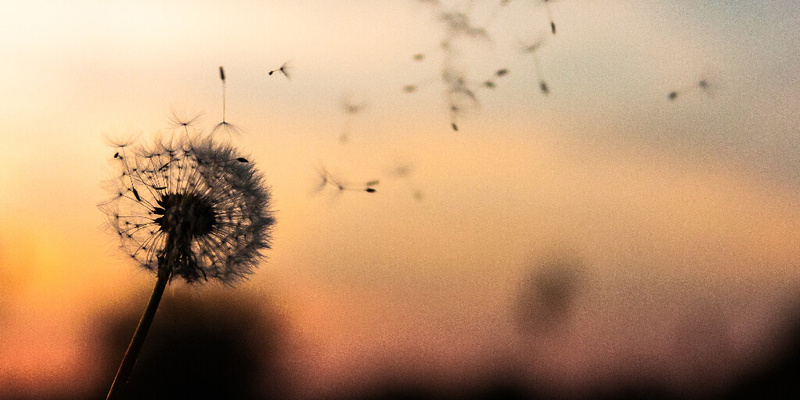 It’s as if I can see him exhale life with each breath, slowly releasing memories into the air, one‐by‐one disappearing as they fly away just like the seeds of a dandelion. I see softball games and M&M pockets, road trips and weddings, hugs and heartbreaks, contagious belly laughs, sickness and more sickness. Each memory hitches a ride on a breeze and drifts away until it is barely visible. One memory though, slowly exhales from his mouth and gracefully rests itself on my shoulder. Unable to recognize it until I take a closer look, I realize…it is Love. I feel a strong connection with this one so I pinch it between my fingers and gently place it in my pocket. The forces have now propelled me into a reality I’m not yet willing to grasp as my father has truly gone home. Leaving the hospital is an indescribable feeling with the knowledge we will never return for another visit, checkup, or test. We walk the halls with hands full of his belongings and empty hearts, passing the critical patients one final time. This time, I pretend they don’t exist. It’s the following morning and I lie in bed contemplating the inconceivable task of informing my 6‐year‐old that his grandfather is dead. I always imagined I would be soft, witty, kind, and gentle in a crisis with my child. I always rehearse the right things to say, but THIS, this feels too cruel. I haven’t yet grasped the meaning of the words he’s gone for myself and yet I have to explain them to my child. “Mommy and daddy have something to talk to you about,” I say with tears in my eyes and a crackle in my voice. He looks at me with innocence that feels as though it can conquer the world – the kind of innocence that is colorblind and believes in superheroes. “Yeah.” He replies as though it’s something he’s known his whole life. The innocence I thought would be shattered is also the kind that stares death in the eyes as if to say, “What are you looking at?” ‐ an innocence of never having lost a loved one and not knowing what it means despite hearing the words. He slowly stands up and takes hold of his giant bear and puts it in my arms. “Here, you hold him now since you are sad,” he says. It is right here in this very moment when I realize: the memory that gently rested on my shoulder like the seed of a dandelion, the one I carefully placed in my pocket, has already landed in its next home. And it is here, where I can watch it grow. Maria Dunn is a poet and writer of creative nonfiction, as well as inspirational pieces. Drawing from a place of healing and hope, she is a relentless believer-of-the-impossible and enjoys connecting with others and making a difference in their lives through writing. She is presently working on her first poetry manuscript, The Art of Being Female, and continues her writing education through university classes and workshops. Some of her work can be found on her blog, The Write Link, through mariadunnwrites.com. Read more articles by Maria Dunn. All original work attributed to Maria Dunn © 2017 Maria Dunn.